A blog for fans of intelligent horror in fiction and film. Look here for reviews, analysis, and practical information on how to deal with demons and live with the living dead. Contracted didn't get much attention and the only review I read was at Rue Morgue and that wasn't favorable. I only watched it because I had an abscess tooth and was on pain killer meds and it caught my eye. I have thought about it since and I think it was almost the perfect zombie movie precisely because you don't know it was a zombie movie until the last two minutes. Samantha (Najarra Townsend) is a lipstick lesbian. Her significant other, Nikki (Katie Stegeman) isn't returning her calls. Samatha's world is spiraling down. She is on her way to a party hosted by Alice (Alice MacDonald) who would like to be Samantha's significant other. At the party, a guy called BJ apparently drugs her drink and nails her in a car. The next morning (Day One) she isn't feeling so hot. She doesn't get better. Over the next two days she bleeds from one end and turns red at the eyes. Her behavior grows more erratic as her appearance grows more grotesque. Her mother thinks she is back on drugs. No such luck. It doesn't end well for Samantha or, I suspect, for the rest of us. The film is flawed by a couple of scenes of explicit violence that interrupt the slow burn that the movie has maintained to that point. However, the last two minutes make the whole show. This one is worth your time. National Lampoon Magazine once featured a “horror movie calculator” or something like that. I am recalling this from decades ago and I didn’t even buy the damn thing; I just read it standing in the drugstore. Anyway, it a hierarchy of choices, such as “Monster cannot be destroyed by a) nuclear weapons; b) bombs or torpedoes; c) guns; d) villagers with torches”. I saw right away that almost all the horror and sci-fi movies I loved could be easily generated by a fairly limited number of such options. The Conjuring (2013) certainly could. Does the action take place in a) a haunted house; b) Tokyo; c) outer space? Select a. Are the primary characters a) a couple; b) a family with children; c) a group of potential heirs to a fortune; d) a group of ghost busters; e) criminals hiding out. Select b and d.
Despite that, TC is a rocking good horror movie. It has more than its share of genuinely scary moments and the primary elements of the horror craft are consistent through the film. I would point out immediately that one of the trailers is very misleading. It leaves you expecting to see one more mockumentary. Except for a few brief scenes, this is a traditional film. In 1971, the Perron family, consisting of Carolyn (Lili Taylor from Hemlock Grove), Roger (Ron Livingston) and their five daughters, moves into an old house. An escalating series of terrifying events convinces them that they are not alone in the house and that the ghostly presence means them no good. The action shifts back and forth between their story and that of Lorraine (Vera Farmiga) and Ed Warren (Patrick Wilson), two veteran paranormal investigators. We watch as they come to the aid of a family menaced by a genuinely terrifying ventriloquist dummy. The Warren house turns out to have a room containing the dummy and other cursed objects. Why not destroy them? It’s best to keep the genie in the bottle. They also have a young daughter. The two stories weave together when Carolyn Perron enlists the Warrens to come to their aid. Along with their team, the Warrens unravel the mystery of the cursed house and the land surrounding it. Armed with that information (along with crosses and holy water) the battle between good and evil is joined. The film purports to be based on a true story. The Perrons and the Warrens are real people and, so far as I can tell, Rhode Island is a real place. I doubt very much whether anything in the film really happened. The casting was near perfect and the acting very good. Lili Taylor and Vera Farmiga were equally compelling in vulnerability and fierce resolve. Patrick Wilson’s portrayal of the ghost hunting Ed Warren is crisply authentic to anyone who has spent some time in small town churches. He looks a bit like Pat Boone. The children were all very fine as well, especially Joey King. The film is strongly scripted. The initial story of the demon doll draws us immediately and effectively into the realm of horror. The weaving together of the two sets of characters and stories is very effective. As I watched one of the stories, I kept wondering what was happening to the other folks. I can’t say that there was any moment in the film that didn’t hold my interest. The dialogue was solid, with only a few gaps and frayed threads in the narrative. The mood of more or less ordinary people facing a steadily increasing menace was consistently maintained. The Catholic Church plays a supporting role in the story. Ed Warren decides an exorcism is warranted but he is not qualified to perform one so he seeks the help of a priest and, in turn, the Vatican. His deference to Church orders is a small but very robust element in his character and it gives the story an old fashioned feel that is very welcome here. Likewise, there is an element of paranormal science in the Warren’s story. We see the two giving lectures. In one lecture, Ed tells us that the worst cases proceed in three phases: Infestation, Oppression, and Possession. First, the demonic presence attaches itself to its targets. Second, it breaks down their resistance with repeated terror. Finally there comes possession. I don’t believe in demons or magic, but I like the idea of such things in fiction and such quazi-scientific demonology makes it feel more authentic. Finally, there is a bit of demonology that is worth reflecting on. Ed Warren explains the difference between two kinds of disembodied spirits: ghosts that once walked the earth as living beings and, he can’t quite say “demons” so says only “the demonic”. This distinction gets fuzzed a bit in the plot, but it is robust enough to raise a few hairs on this neck. The film does well by avoiding contemporary special effects. The action works by people moving down corridors, crawling through crawlspaces, and falling down stairs. Oblique camera angles and partially glimpsed backgrounds are the primary visual strategies. There are also a number of devices that work beautifully in the context. One is a hide and seek game that the children play and the mother is enticed into. The seeker ties a cloth around her eyes and feels for the hiders. Three times she can all out “clap” and everyone has to clap twice. I am not spoiling much by telling you that there are more sets of clapping hands available than there should be. It is not impossible for a big studio to make an effective horror film. This one is pretty damn good. For thousands of years our ancestors lived in a world populated by invisible, malevolent spirits. They depended on priests and shamans to protect them. Whether we have left that world or not is an open question. One function of horror fiction is to entertain us and perhaps enrich us by bringing the view of our ancestors back into focus. Sit down with The Conjuring for a couple of hours and see if it is like remembering something you once chose to forget. Holy Buckets, but this one was a lot better than I expected. 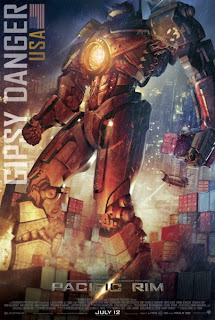 Given that movie making these days seems to have been reduced to choreographing action sequences (see Star Trek) and allowing for the fact that belongs to that general category of movies in which giant monsters battle giant robots, it’s hard not to award Pacific Rim five out of five stars. It does a superb job of almost everything that can be expected of such a film. The earth is invaded by giant reptiles (Kaiju), which enter our world through a dimensional rift on the ocean floor. 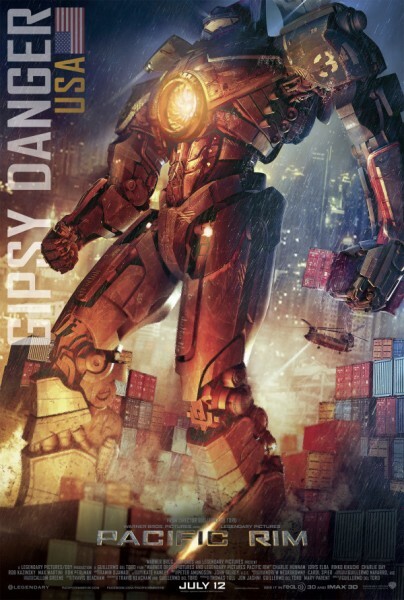 Mankind responds by pulling together and building giant, humanoid robots (Jaegers). Each Jaeger is controlled by two pilots ( or in one case, a set of triplets) who are mentally linked with the machine and with each other. After seven years of war, the tide turns against mankind as the Kaiju increase in power and numbers faster than human industry can respond. A former Jaeger pilot is brought out of retirement to command one of the few remaining machines in a last ditch effort to close dimensional portal. Charlie Hunnam (Jax Teller on Sons of Anarchy) has the lead role as our returning pilot. Emotionally wounded but not weakened by the death of his brother/partner early in the war, Raleigh Becket is now paired with Mako Mori (played by Rinko Kikuchi). Mori carries a heavier set of emotional baggage, having lost her family to a Kaiju attach when she was a child. The pairing of pilots is a clever device for keeping relationships neatly sorted. In addition we get a father/son pair, a Slavic husband and wife team, and the Chinese triplets, in diminishing degrees of exposure. We also get a pair of deliciously quirky tech nerds (actors Charlie Day and Burn Gorman). Finally, Idris Elba gives us Stacker Pentecost, the fiery commander. If you haven’t heard him declare “Today, we are cancelling the apocalypse” you haven’t been listening. All the actors are very well cast, physically and temperamentally. The storyline is boilerplate fantasy/sci-fi. Hopelessly outgunned, our heroes must overcome inner demons and mutual mistrust in order to pull off a more or less miraculous stratagem. Think here of Independence Day, The Lord of the Rings, and The Avengers. The dialogue is a bit better than you would expect, if not the least bit inventive. The pacing and mood, however, are very good. I found that the sense of desperation was very convincing and built steadily throughout the film. This owed a lot to the role played by the two tech nerds, who argue incessantly about what is going on and what will happen next. Of course, they both turn out to be right. The real test of this kind of movie is whether it can rekindle some of the same excitement I felt when I was six years old and saw Godzilla for the first time. It did that. The special effects were flawless and spectacular. I doubt whether anything as large as a Jaeger or a Kaiju has ever been thrown into the air on planet earth, let alone the one punch the other out. The laws of Hollywood physics were scrupulously observed, so the action felt plausible without being fitted out for any thinking. Along with the sound and the texture of water and fire, everything seemed to be suitably heavy. I am happy to report that there was not a hint of offensive, Peter Jackson goofiness in the action. The interiors of the Jaeger fortress had an iron retro look, a bit like the Nautilus in 20,000 Leagues Under the Sea (1954). Pretty much everything else, including the inside and outside of the machines, the streets of Hong Kong, and the monsters was glowing with red and blue pastel fire. It was visually delightful, due in part to the fact that the power never went out even when flying giants were scraping the architecture off of whole city blocks. There were a lot of rather blunt references to Independence Day (1996). We learn a lot about the enemy when one of the scientists mentally interfaces with an alien brain. For instance, the creatures responsible for sending the Kaiju here are in the habit of plundering whole worlds. Those same aliens look rather a lot like the critters that Will Smith and Jeff Goldblum waved at from their hijacked spacecraft. I will stop there, but there is a lot more. This borrowing is so blatant that is must mean something. I have no clue, unless it was just lazy theft. There is almost nothing new or surprising here, so I can’t quite give it five stars. It is certainly four star popcorn fun. Box office returns seem a bit anemic, which is probably due to the fact that there is so much apocalyptic banging going on in summer theaters that audiences are just worn out with it. It is also possible that the idea of giant robots sounds too Might Morphin’ Power Rangers. I note that the Jaeger pilots are called rangers. That is too bad, because this is the sort of thing you will really like if you like that sort of thing. I do. My three favorite horror films made in the last five years had at least two things in common. Each was made on a shoestring budget and all three presented contemporary versions of stories that were once told to scare children. 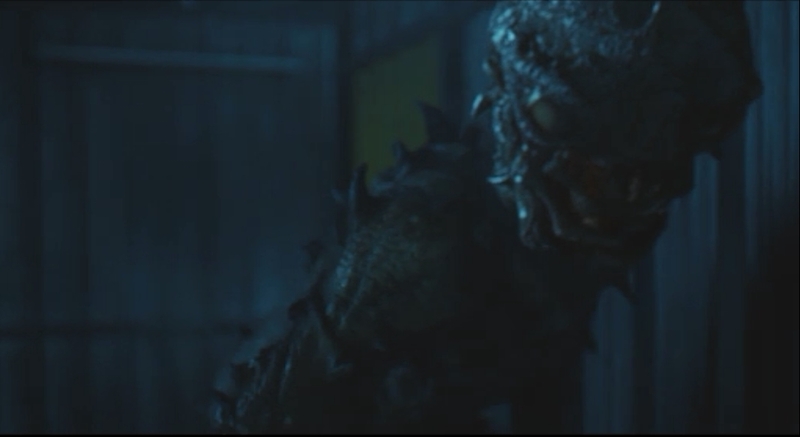 Troll Hunter (2010) and Absentia (2011) gave us two distinct versions of the troll: the large lumbering creature in the forest (more or less a Norwegian counterpart to the Japanese kaiju) and the creepy, crawly, thing under the bridge that will drag you back into its lair. Thale (2012) makes a very fine third entry. Here the mysterious creature is not a troll but one of the many imaginary hominids who populate the wooded and cragged regions of our dreamlands. They are shy and so at home where there is a lot to hide behind and where it can be perilously difficult to distinguish a crooked branch from a furry femur. The forest folk may or may not be malevolent but they are usually as suspicious of us as we are of them. An encounter with them may occasionally promise some prize. It always involves a peril. Thale (pronounced tall-eh, as best I could hear it), like Troll Hunter, is a Norwegian film. It was written and directed by Aleksander Nordaas, apparently on a budget of $10,000. The action opens with a couple of fellows cleaning up soupy viscera off of someone’s floor. Leo (Jon Sigve Skard) is the crime scene cleanup veteran. 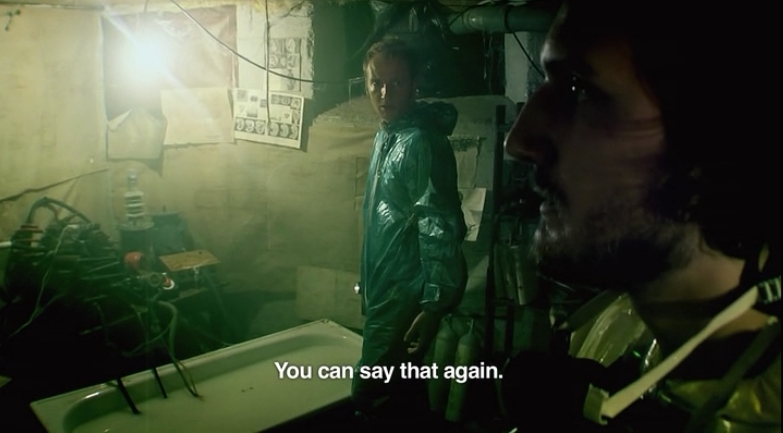 He works stoically and patiently while his partner Elvis (Erlend Nervold) pukes into a bucket. Elvis is not a man who had other options. They are called to another location where some poor fellow has excreted his entire remains down an outhouse hole. They are compelled to enter the house and at that point the two characters switch roles. Leo is cautious and keeps telling his partner not to touch anything. Elvis succumbs to the lure of mystery and cannot resist exploring. Eventually they discover a woman hiding in one of a series of dirty rooms. Thale (Silje Reinåmo ) is beautiful, naked and mute. In short order they will discover that she is no ordinary girl and that she is being hunted by two sets of characters with very different powers and motives. The film builds steadily from its quiet but dismal opening toward a climax of violence and horror, all the while following a delicious mystery. It treats us to a terrible retribution leavened with magical grace. Nordaas is an alchemist, turning blood, viscera, and abuse into something exquisitely beautiful. I will add here two features of the plotting that are very well done. Elvis is immediately taken with Thale and at first it seems as if this is out of a sexual attraction. No one could blame him. In fact, she reminds him of his daughter. Apparently he is estranged from the mother and child, which goes to explain why he took this awful job. His instinct is fatherly. He wants to protect Thale. That will have important consequences. Second, we get some quazi-scientific commentary from cassette tapes recorded by Thale’s deceased benefactor (the guy in the outhouse). This is done not to make the myth seem more plausible (it wouldn’t serve that purpose) but to weave the mythic aspects of the story together with the stories that modern natural history offers up. That is exactly how this sort of thing ought to be handled in horror fiction. Thale is a first rate piece of work. It appears that a sequel is in the works, no doubt with a considerably bigger budget. It will be a miracle if that doesn’t ruin it. Don’t miss this one. If you could search through a storage facility you’d find a ton of stuff that was boring and worthless but, sooner or later, in some mislabeled box, you’d probably find something you didn’t expect. If you watch Storage 24, you will find much the same, except for the unexpected thing. I watched the film because the trailer at Apple was pretty good and it was free on Netflix Instant. I will confess that I enjoyed it. Boiled down a bit more, it would have made an excellent hour long episode of your favorite anthology show. As it was it was tight enough to keep my interest. Charlie and his best friend Mark are on their way to a one of those large locker outfits so he can get this stuff out. He has to do this because his girlfriend gave him his walking papers. He is way short of being over it. Meanwhile a plane crashes in central London, where said storage building is located. If I am spoiling any surprises by telling you that something really nasty has survived the plane crash, then are easily surprised. Inside the building he runs into his ex, a mousy faced blonde, accompanied by a rather more striking blonde and a guy that Charlie takes to be her new beau. Guess what? They get locked inside and soon they are running from their lives from something rather more militant than your average al Qaeda foot soldier. Confining the action to the inside of the Storage 24 building solves the original problem of almost any monster flick: how to bring the predator and the protagonists together and keep them together while allowing enough room for the action to play out. The jilted lover backstory gives the characters a little depth. All the writers and director have to after that is cobble together a monster. This one stole his head from Predator, complete with the lobster claw face. I can’t think of much else to say except that I enjoyed seeing Noel Clarke as Charlie. Clarke played Mickey Smith in the Doctor Who series. He is a very competent actor and he lends this film all the dramatic value that it has.